In an exclusive interview with Behindwoods Air, Madai Thirandhu show, Seeman spoke about his views on changing the system and other politicians. The interview opened with the anchor asking from where do the funds come for Naam Tamilar Party and Seeman replied to it saying they have not much money and they get donation from people. When speaking about his manifesto, the anchor asked whether he had drawn any plan to see how possible it is to do all the said promises within the state’s income considering he plans to close Tasmac, Seeman replied saying, there should be alternate sources of income. When speaking about foreign countries and their technological development, anchor Gabriel spoke about how technology is infused in food industry and farm production is multiplied in developed countries even when they have less than 5% farmers, Seeman denied it and stating only 28% technology growth is there in the developed countries and it is mostly farming, the anchor called it was wrong data. The anchor questioned about 50-50 chances Seeman gives to women and compared it with Justin Trudeau and mentioned how he called the 50-50 chance itself as an achievement and asked why can’t Seeman concentrate on talent and give the chance to more deserving people either to more women or to more men whomever is talented. Seeman replied saying, he can’t question him considering we live in a country where even 33% is not allotted for women and that they are considering to increase in the upcoming elections. He was questioned about how he plans to pressurize the Union Government into giving into his demands, he replied saying he will demand the promises to help them form the government and pressurize them to give in. Otherwise, he said he plans on fighting for it. Anchor Gabriel showed Kamal Hassan’s campaign video and asked him to react to it. 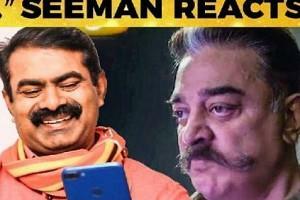 Seeman laughed and replied that Kamal is simply seeking vote for Naam Tamilar Party after watching the video. He also spoke about the actor-turned-politician. He also asked how he is partially separating themselves in the name and identity of language, Seeman said that is how it works. Language unites people and religion separates people. Seeman also spoke about system change and how like British, the ruling power holds the money and people are still suffering. For detailed interview, please watch the video.